A new study has given a ray of hope to the free-to-air TV networks’ futures, suggesting that the arrival of addressable TV will become a rich vein of ad bucks for the broadcasters. The study, by Roy Morgan Research, found that addressable TV will give the likes of Seven, Nine and Ten the ability to target advertising at finely segmented audiences. On a less fortunate note, the study also found that a vast majority of Australians remain “sceptical” about the ads they see on TV. Seventy-five per cent of respondents agreed that “some TV advertising is devious” and a further 67.6 per cent aid “nearly all TV advertising annoys me”. The key, the study found, for commercial TV channels looking to maximise their advertising revenues is understanding what their audiences want to watch and then providing the correct content to engage with their audiences. Over 90 per cent of Australians aged 14-plus watch TV in an average week equivalent to over 18.5 million potential consumers. Of this massive audience over 16.5 million (81.8 per cent) watch commercial TV on an average day while a further 6.4 million (31.8 per cent) watch pay TV/SVOD in an average week. Clearly there is a large degree of crossover in these audiences although already there are those who only watch one or the other, the study noted. The study also analysed different generations views of TV and how they interacted with it. Unsurprisingly, over 65 per cent of Zs watched TV while surfing the net, while respondents aged 70-plus agreed they always watch TV news to “keep me up to date”. Commenting on the study’s findings, Roy Morgan CEO Michele Levine said: “In recent years the rise of the internet at the expense of more traditional advertising mediums has often been accepted as a fait accompli. However, new technologies such as addressable TV give traditional media the ability to fight back and retain, and even grow, their shares of the advertising pie. 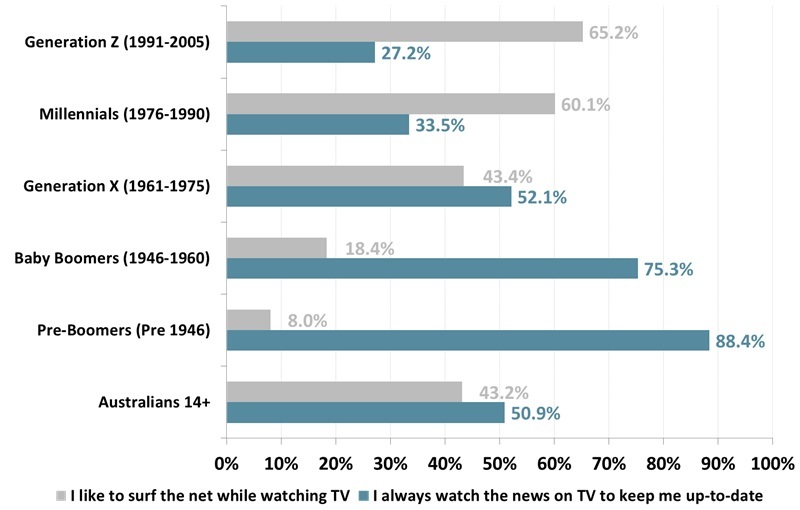 “While large majorities of Baby Boomers (75.3 per cent) and Pre-Boomers (88.4 per cent) ‘Always watch the news on TV to keep me up-to-date’ only a third of Millennials (33.5%) and just over a quarter of Gen Z (27.2 per cent) are avid consumers of TV news. “The different priorities younger and older generations have when watching the TV are highlighted when further research reveals nearly two-thirds of Gen Z (65.2 per cent) and two-fifths of Millennials (60.1 per cent) ‘like to surf the net while watching TV.’ This is in stark contrast to the older generations as only 18.4 per cent of Baby Boomers and eight per cent of Pre-Boomers surf while watching TV. “Only Roy Morgan which conducts over 50,000 in-depth face-to-face interviews each year with Australians in their own homes can deliver an understanding of Australians of all shapes and sizes segmented by any demographic or attitude deemed important to gaining the edge on the competition,” Levine said.